Over the pond in England there’s a brand new campervan that is taking the country by storm. It’s called the Dalbury E- Electric Campervan. Yup, I said electric! 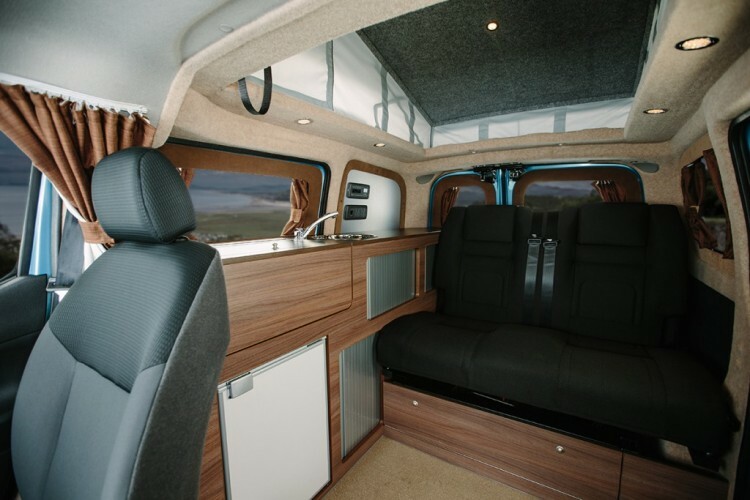 Richard Mackney of the website Hillside Leisure, recently reviewed the brand new campervan. As the the owner and daily driver of a T5 campervan, Mackney was already an enthusiast of this type of vehicle. He and his family love to use their van for vacations. With two kids under the age of 10, a campervan makes life a lot easier. When Mackney heard that Hillside Leisure would be launching the world’s first electric campervan at a show Birmingham, naturally he was excited to see it in person. 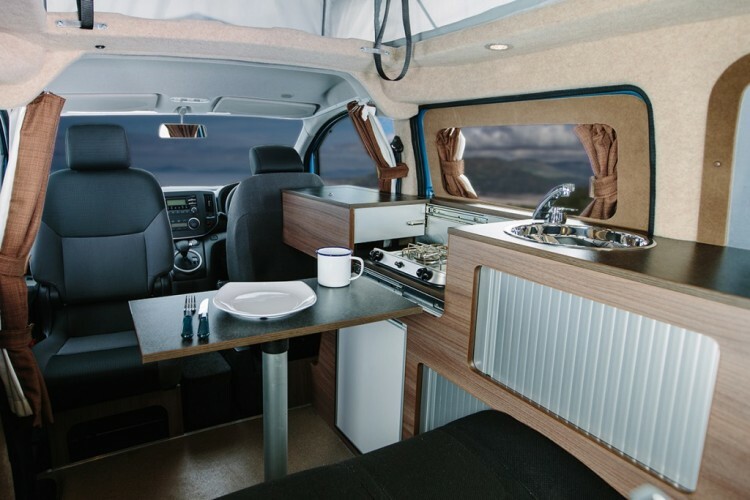 Mackney uses the word “futuristic” to describe the look of the campervan. He loved the electric blue color and mentions that when manufactured, the campervan have the option of color coded bumpers and alloy wheels. The outside of the campervan does not scream “Electric Vehicle” and Mackeny has mixed feeling about this. One one hand, he felt that a few graphics hinting at it’s all electric function would help it stand out in the market and be noticed as the pioneer that it is. Then again, as he notes, “most owners would probably prefer a low profile”. He readily admits to being a bit nervous since he had never driven anything like this before. Electric cars are not mainstream, and while similar to an automatic, they are not the same thing. Here’s the weird part. He placed his foot on the break and shifted into drive, and away he went…with no noise. With the exception of a low level whine, the electric motor was completely quiet. Mackney drove the city (turning heads every where he went), and watched the dash where a range of details such as the remaining miles until a recharge where displayed. He had been given a run-down on the different charging options, but knew that on his short first ride he wouldn’t end up needing to charge the campervan. The Dalbury takes around 8 hours of charging time to reach 100% battery life. This is based on the typical house or campsite socket, but at fast charge stations it will only take 30 minutes to reach 80% battery life. Since more and more people are using electric vehicles, the charging stations are becoming increasingly easier to find. Websites such as zap-map.com provide a full directory of UK locations. As of January 2015, there are 7,579 available stations in the UK. The hood has flaps in the front that open after you release the catch from inside. This is not much different from releasing the hood in a normal car. Under the hood you will find an additional 240V socket. 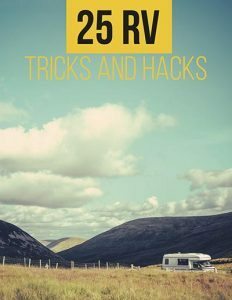 This helps you to charge the vehicle without needing an extra socket if you are at a campsite. How cool is that? If an all electric vehicle with advantages like zero emissions and lower fuel costs is not enough, this is also a fully functioning campervan. Hillside Leisure is not new to the campervan market. They have already manufactured a successful conversion van that uses traditional fuel. 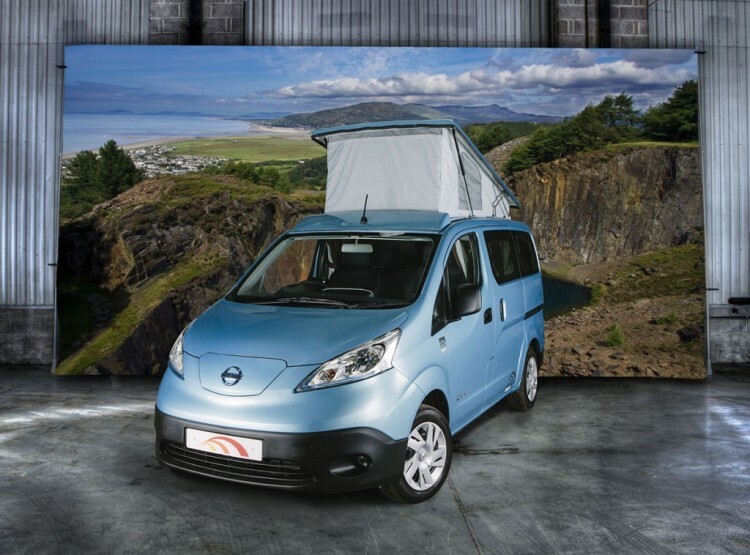 The Dalbury E Electric is designed to be a smaller and more compact campervan. It measures in at nearly three feet shorter and a few inches narrower that a VW transporter which allows for easier parking. The Dalbury E is equipped with a spinning passenger front seat and rear seat made by RIB. Both can converted into beds within seconds. The conversion is smooth and easy to operate. You simply lift a lever and move the seat close to you. Then you lower a lever at the base of the seat to make it recline. You can position the seat at any angle. You can recline slightly for reading or lay flat for sleeping. The kitchen is the perfect size for enjoying a cup of tea in the middle of the day. The sink is spacious enough for all your dishwashing needs and you can even use it to brush your teeth at the end of the day. The equipment are all high quality as Hillside uses only most well-known manufactures in the industry when designing the kitchen.There is a small 39-liter fridge with just enough space for the essentials. Mackney found the pop top roof easy to use and operate. This version of the Danbury does not have a roof bed. 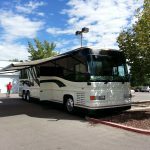 However, raising the roof offers storage and additional headroom when needed. 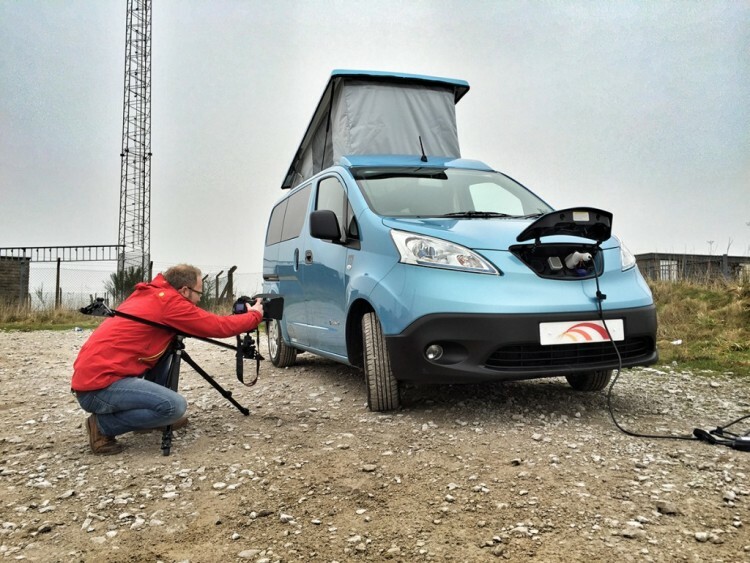 Richard Mackney thoroughly enjoyed the experience of driving this electric campervan. He was impressed by the smooth ride, he enjoyed how easy it was to accelerate, and he found the silent engine relaxing. On the other hand, he had a constant nagging in the back of his mind about where the next power source would come from. He continually checked how much power he had used, and how much he had left. 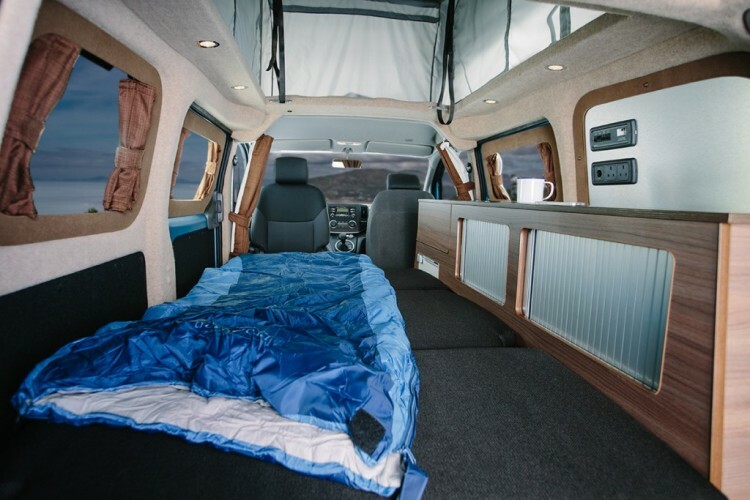 Richard estimates that a 200 mile journey would cost over $80 in his current T5 diesel campervan. However, when using the Danbury E it was much, much cheaper. Since I haven’t driven or explored the Dalbury E for myself, it’s hard to compare it to a regular fossil fuel campervan. I have to admit though, I love the idea of traveling by electricity. 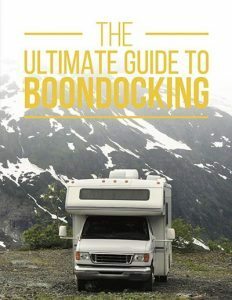 Richard’s review encouraged me to open my eyes to the variety of new opportunities in the world of camper vans. Now, if only that unit would come to the U.S. I think I want one, how about you? Leave your comments below. Once you are done, send this article to your friends. Tweet it, pin it, share it, like it. Let’s get the word out and start the conversation! To learn more read Richard Mackney’s full review.